Unlock the mindset and skill set needed for critical thinking and creative problem solving. Learn creative problem solving, how to improve collaboration, build creative solutions, and drive innovation. 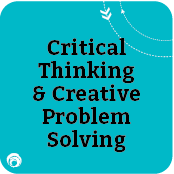 In this course you will learn about the important relationship between critical thinking and creative problem solving. First you will build skill in critical thinking and be introduced to tools needed to evaluate information, ideas and assumptions in a disciplined and productive manner. Next, you’ll be introduced to the FourSight Thinking System™ as a model for Creative Problem Solving, a process for innovation that helps you explore and reframe the problems you face, come up with new, innovative responses and solutions, and then take action. Creative Problem Solving establishes a dynamic balance between creative thinking and critical thinking and uses tools and techniques that make problem solving fun, engaging, and collaborative. With FourSight™, participants learn a language and approach to problem solving that enables productive collaboration, increases engagement, and fosters a culture of innovation. By leveraging creative thinking principles, participants learn an “idea protocol” to promote the development and growth of new ideas and creative solutions. Your Tool Cards, 20 unique creative and critical thinking tools to enhance the FourSight Creative Problem Solving process, focus innovation efforts and drive greater results. Develop critical thinking skills that you can use every day. Explore challenges and opportunities with greater clarity and ease. Communicate, collaborate, and solve problems more effectively. Understand how the creative problem-solving process drives innovation. Build creative solutions with increased chances for adoption. Tackle planning, forecasting, communication and decision-making challenges more strategically. Learn how to capitalize on your team members’ individual approaches to problem-solving and achieve greater innovation.